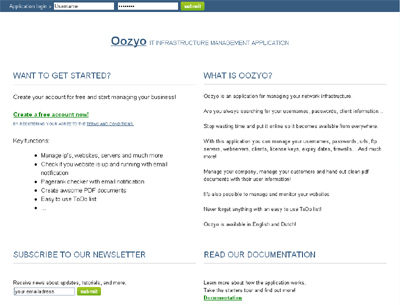 Oozyo is an application for managing your network infrastructure. Stop wasting time and put it online so it becomes available from everywhere. With this application you can manage your usernames, passwords, urls, ftp servers, webservers, clients, license keys, expiry dates, firewalls… And much more! Manage your company, manage your customers and hand out clean pdf documents with their user information! Oozyo is available in English and Dutch!